I EMBROIDER THEM, AND I HAVE SEVERAL OTHER DESIGNS. PEACOCK DESIGN, EMBROIDERED ONTO PURPLE COLOR HAND TOWEL. THESE MAKE A VERY UNIQUE & PRACTICAL GIFT, USE THESE LIKE YOUR NORMAL TOWELS. THE NEEDLES DO NOT DRIVE THE THREAD ALL THE WAY THROUGH THE TOWELS, THIS LOOKS LIKE A BIT OF PLASTIC. Soft Plush Fabric Hand Towel. Soft, comfortable, protect children's skin. Material: PlushFabric. SKETCHED SKULL AND CROSS BONES HS0996. Embroidered 100% Cotton Purple Bathroom Hand Towel. Design is approx. 3" X 3" Hand Towel 16" x 26". PURPLE BUTTERFLIES WITH YELLOW FLOWER HS0254. Embroidered White 100% Cotton Kitchen or Bathroom Hand Towel. Design is approx. 4" x 4" Hand towel 16" x 19". Will try to describe as best possible including shading variances and any other notable details. Croscill Chambord. Nice Used Condition. The floral border on two of the six towels is a little more muted in color than the others. Crouching Purple Dragon HS0896. Handmade Embroidered 100% Cotton Bathroom Hand Towel White. Design is approx. 4" x 4" Hand Towel 16" x 26". HUMMING BIRD, EMBROIDERED DESIGN, PURPLE OXFORD HAND TOWEL. I EMBROIDER THEM, AND I HAVE SEVERAL OTHER DESIGNS. THESE MAKE A VERY UNIQUE & PRACTICAL GIFT, USE THESE LIKE YOUR NORMAL TOWELS. THE NEEDLES DO NOT DRIVE THE THREAD ALL THE WAY THROUGH THE TOWELS, THIS LOOKS LIKE A BIT OF PLASTIC. LSU - PURPLE GOLD HS0310. Embroidered White Cotton Bathroom or Kitchen Hand Towel. Design is approx. 2" x4" Hand Towel 15" x 25". Tree frog on a branch HS0959. Embroidered Purple Bathroom Hand Towel. Design is approx. 4" x 4" Hand Towel 16" x 26". Design is approx. 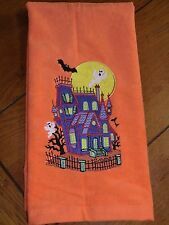 4" x 3.5" Hand Towel 16" x 26". HERS IN BLACK LETTERS HS0840. Embroidered Purple 100% Cotton Bathroom Hand Towel. Design is approx. 4" x 2" Hand Towel 16" x 26". Excellent gym towel as well! This towel makes a nice gift. The hanging loop is on the long side of the towel. 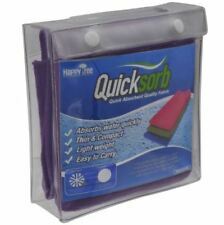 The towels also keep their shape well after washing and are tested for absorbency. Colorful Easter Egg HS0738. Embroidered Purple 100% Cotton Bathroom Hand Towel. Design is approx. 3" x 4" Hand Towel 16" x 26". 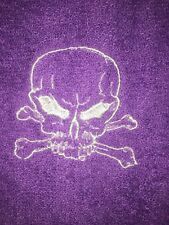 Embossed Skull w purple Thread- HS0887. Handmade Embroidered 100% Cotton Bathroom Hand Towel Dark Purple. Design is approx. 4" x 4" Hand Towel 16" x 26". Marijuana Leaf #3 in green thread- HS0917. Embroidered Purple Bathroom Hand Towel. Appliqued Embroidered Beige 100% Cotton Mainstays Bathroom Hand Towel. Bright tones of hot pink/coral (appears more red in photo, but is a bright pink), purple, mint green, black, etc. on white background. Generously sized. Includes (approx. One Bath Towel (28" x 54"). ). Sea Turtle Doodle w purple thread - in waves HS1067. Embroidered Handmade 100% Cotton White Kitchen Bar Hand Towel.